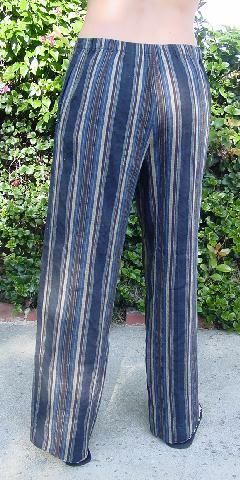 These striped wide leg pants are DKNY Classic and are 56% linen, 22% polyester, and 22% rayon. The waistband has elastic in the back and drawstrings in the front. There is a 5 1/4" long front zipper fly and a front hidden large hook waist closure. 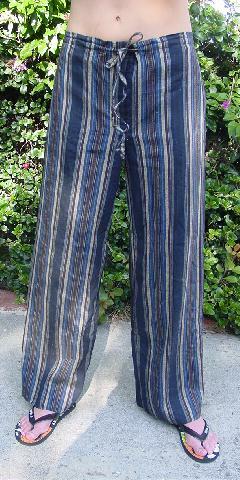 It has an alternating vertical stripe pattern in black, blues, browns, and antique white. There are 2 side seam slash pockets. waist to bottom of leg 40 1/2"